In our last lesson we saw the importance of our reactions. What happens to us is not nearly as important as how we react. If we do not resent an insult or an injury, the chances are that it will do us little harm. On the other hand, if we allow the matter to become a resentment, it can do us great harm. What is resentment? Why is it so destructive? What effect will it have on us? How can we turn from bitterness to forgiveness? We will find the answers to these important questions in this lesson. 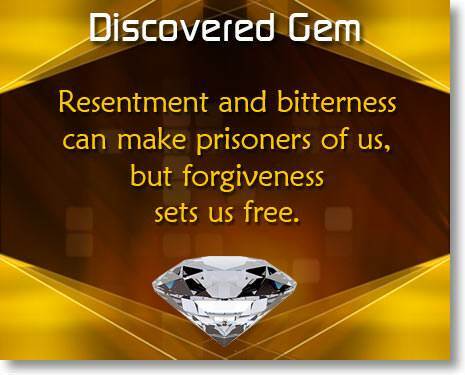 Resentment is that deep feeling of displeasure or anger that we have toward someone because of a past offense. It is our painful memory of past hurts. Resentment is the great enemy of right relationships. It destroys friendships and turns friends into enemies. But the most damaging effect of resentment is the destruction of the one who holds it. A pastor was called to the bedside of a dying man. He was a man whom nobody liked. He was hard, bitter, and sullen. He lived in a tumble-down shack on the edge of town. When he went into town, he made it clear that he didn't want to speak to anyone, and he didn't want anyone to speak to him. Even the children ran from him. People wondered what had made him so bitter and mean. Some thought he had a guilty secret. Others were sure that he had committed some terrible crime and that he was a fugitive from justice. But they were all wrong. The simple truth was, when he was a young man, a friend had done him a grievous wrong. He was so angry about it that he said, "I'll remember it until my dying day." And he did. 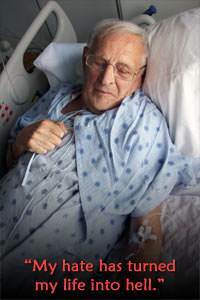 He said to the pastor who sat at his bedside, "I've gone over it every morning. I've thought about it every night. I've cursed that man a hundred times a day." Gasping for breath, he continued, "I see now that my bitterness has eaten out my soul. My hate has hurt nobody but myself. But God knows that it has turned my life into hell." 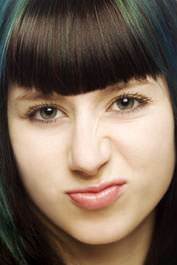 Why do we Hold Resentment? Of all the evil, destructive things that can happen to us, resentment is one of the worst. It is like a deadly germ, working constantly to gain power over us to destroy us. No right-thinking person would harbor and nourish a deadly germ in his body, knowing that this germ would eventually kill him. Yet many Christians hold on to the sin of resentment which is far more destructive than any germ. · We feel justified in our resentment. One reason why it is difficult for us to recognize the poisonous nature of resentment is that it seems right to us. We feel that we are justified in our resentment. We say to ourselves, "It is only natural to resent so-and-so." In order to justify our resentment, we often build in our mind a false image of the other person. We push aside the whole picture of what that person is and all the good and decent things he may have done and focus on his offenses against us. · It makes us feel superior. When someone does something that offends or hurts us, we take a superior attitude toward that person. We say to ourselves, "I would never do a thing like that!" We like this feeling of superiority, and therefore we hold on to our resentment. 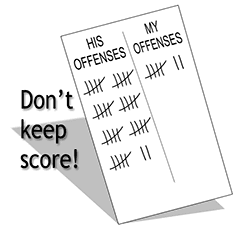 · We like to "keep score." Sometimes we hold on to our resentments in order to have something to offset any future offenses we may commit. We want to be able to say, "Maybe I was wrong in that matter, but you did such-and-such to me." · We enjoy our resentments. Strange as it may seem, we keep our hurts alive for the pleasure we get out of them. We enjoy nursing our wounds and feeling sorry for ourselves after someone has offended us. Resentment is one of the most unusual of all sins in that it is meant to punish the other person; yet it is far more hurtful to us than it could ever be to the other person. Sometimes the other person may not even be aware of having done anything wrong. Therefore our resentment does not harm him at all, but it is very destructive to us. Bitterness is poison to our body. Resentment, bitterness, hatred, and unforgiveness can cause ulcers, high blood pressure, and dozens of other diseases. It has been estimated by some doctors that as much as 90 percent of our illnesses are caused by anger, fear, resentment and bitterness. It has been proved that bitterness can and does bring on depression. People who have a tendency to be depressed much of the time are often people who hold resentment against a loved one or relative who injured them earlier in life. If you are one of these people, you will never know lasting victory over depression until you get rid of that bitterness. The more we resent someone, the more we think about him. And the more we think about a person, the more we become like him. It is a fact that, when you focus your emotions on someone, you tend to become like that person. A teenager was bitter against a relative. When it was suggested by a youth worker that she should forgive that relative, the teenager said, "I'll never forgive that person as long as I live." The youth worker casually replied, "I'm sorry to hear that." "Because in twenty years, you will be just like that relative," replied the youth worker. Bitterness affects our relationship with God. When we pray the Lord's Prayer, we say something like this, "Forgive us our trespasses as we forgive those who trespass against us." When you pray this, you are saying, "God, please forgive me of my sins just like I forgive other people of their sins against me." If you don't forgive other people, you are actually asking God not to forgive you. The only thing that can set us free from resentment and bitterness is forgiveness. But not many people truly understand what forgiveness is. Forgiveness is not trying to overlook sin or to pretend that it never happened. Forgiveness is not trying to forget. Forgetting comes after forgiveness, not before. What is forgiveness? Forgiveness is bearing the wrong or injury yourself and choosing to remember it no more. Forgiveness means that you give the person who wronged you a clean slate so far as you are concerned. Forgiveness is costly. The one who forgives pays the price of the injury or evil that he forgives. 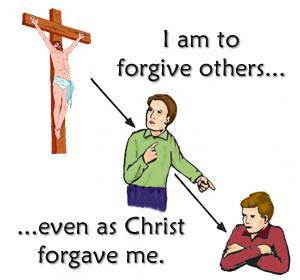 In order for Christ to forgive us, He had to pay the penalty of our sins. This is why He died on the cross. 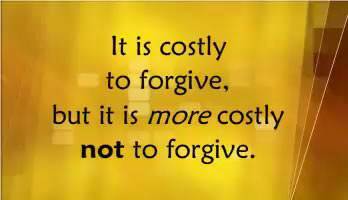 It is costly to forgive, but it is more costly not to forgive. You may have remembered a certain injury or offense a long time. You may be thinking of it right now. That person may indeed have done you a great injustice, but that injury did not do you nearly the harm you have done yourself by holding that resentment. 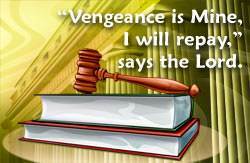 Recognize that God is the Judge. God tells us not to try to "get even" or to avenge ourselves, but rather to forgive. When we forgive someone, we are turning that person over to God, recognizing that He alone has the right to judge and punish people for their wrongdoing. Confess your sin to God. The other person may have done you a grievous injury. If so, he is responsible to God for this. But, if you are holding bitterness, you are sinning, and you are responsible to God for your sin of bitterness. To deal with this sin, you must confess it to God and ask Him to cleanse you with the precious blood of His Son. Pass the sentence of death upon resentment and bitterness. "Lord Jesus, I was crucified with You. Because of this, I have the right to refuse any sin that belongs to my old life. Right now, I refuse and reject this bitterness, and I ask You, by Your Holy Spirit, to put it to death." Forgive even as Christ has forgiven you. Forgiveness involves a choice on our part. We must choose to forgive. We may not feel like forgiving the other person, but God deals with our choices, not our feelings. You may say, "But suppose that person doesn't ask for forgiveness or even admit that he was wrong? How can I forgive him?" So far as we know from the Scriptures, no one ever came to Jesus and asked to be forgiven of his sins. 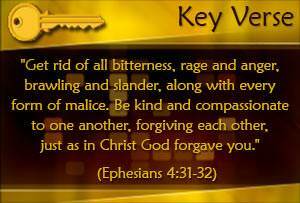 Yet Jesus did forgive people. He forgave them in a very special way. He forgave them unilaterally. The word "unilateral" looks like a very difficult word, but it is really not hard to understand. It means "one-sided." To forgive someone unilaterally means that you forgive him from your side, regardless of what he does. He may not ask for forgiveness. He may not even know that he needs to be forgiven. But you can choose to forgive him anyway. The ones who crucified the Lord Jesus did not ask for forgiveness, but Jesus forgave them anyway. He prayed, "Father, forgive them, for they know not what they do." Forgiveness flowed out from His heart to those who did not ask for it or deserve it. This was unilateral forgiveness. Although the other person may not ask for forgiveness or even admit that he was wrong, you can still forgive. You can forgive unilaterally. Trust the Holy Spirit to make your forgiveness real. Clara Barton, founder of the American Red Cross, was asked on one occasion if she was still speaking to so-and-so. "Why shouldn't I?" she replied. Her friend who had known years ago of an offense which this person had committed against Miss Barton reminded her of the offense. Her response was, "Oh, I distinctly remember forgetting that offense." An important part of turning from bitterness to forgiveness is dealing with our feelings. We can choose to forgive and mean it with all our heart, but the hurt is still there. To be fully free from resentment and bitterness, we must deal with our feelings. Is there a way by which we can deal with our feelings? Yes, there is! The way to deal with our feelings is to change the way we look at a matter. We cannot change the facts of a past situation, but we can change the way we look at the matter. 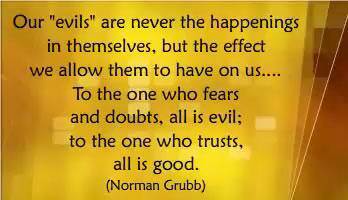 Remember, we are controlled by the way we inwardly see and believe things to be. Consider Joseph. 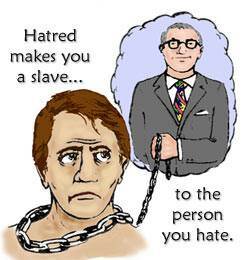 We have already seen how Joseph's brothers hated him and sold him as a slave. The facts of the situation could not be changed. What had happened, had happened forever. Yet Joseph was not resentful toward his brothers. Notice that this verse does not say that we "see" or that we "understand," but that "we KNOW that all things work together for good to those who love God." We may not see or understand how all things are working together for our good, but we can know it because God says so. "Lord, what that person did seems bad to me, but You said that all things work together for good to them that love You. I am believing You to bring good out of this just as You did in Joseph's case." When we believe that God is using all things, even those things which seem bad to us, for our eternal good, we see things in a different way. We can actually thank God for the things that happened to us. This takes the hurt out of past offenses and sets us free from resentment. 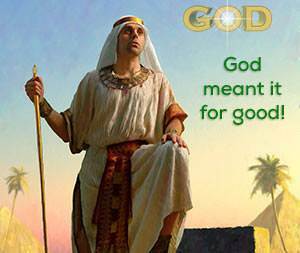 Concerning those who wronged us, we can say with Joseph, "You meant evil against me, but God meant it for good."